The creative team of writer Dan Wickline and writer Phillip Sevy return with the latest issue of this fascinating miniseries (or is it an ongoing? I just realized that I don’t know. ), and this issue offers a bit more information about this new world and the people living in it. We learn that Ray has been a bit more passive in his role of unfreezing people than originally planned. Gavin has been the one making most of the decisions and Ray says he’s just been going along with it since Gavin seems to know what he’s doing. 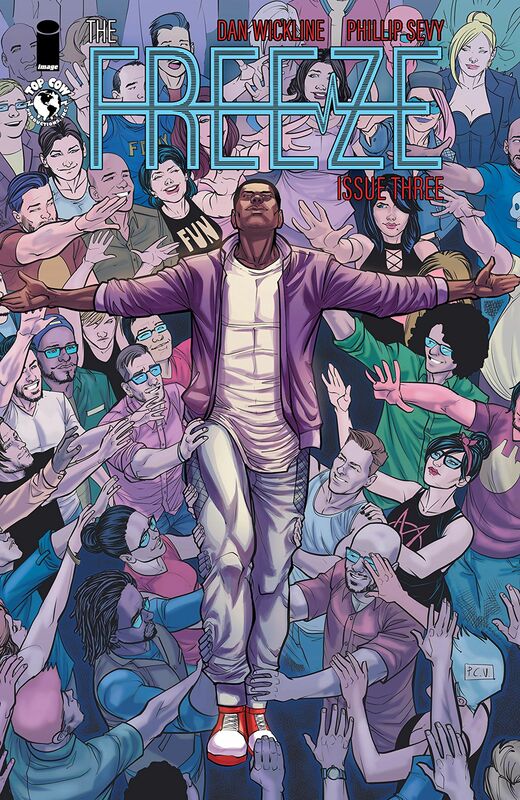 We still don’t know how long it’s been since the first issue, although this one takes place not took long after the second issue ended, but to date they have unfrozen one hundred and twenty seven people. This issue opens with them gathering everyone to tell them about the mutilated body that they found in the grocery store. Someone sliced open the chest and removed the heart of a frozen woman. Technically she’s not dead yet, but she will be if Ray unfreezes her. They warn everyone to keep their eyes open, and to let them know if they know anything about this. Gavin had Ray unfreeze two new people, and ex-Marine named Winston and an ex-LAPD detective named Edgar, to investigate the crime. Lisa’s sister also does some detecting on her own and proves to be pretty smart herself. We find out from Adam that there’s a group of about a two dozen of the unfrozen who have formed a religious group called The Awakened, who have come to believe that this is all a Biblical-level Act of God, once again cleansing the Earth, and that Ray is a Prophet who was specially chosen by God to decide who is worthy of being unfrozen. This makes Ray extremely uncomfortable. There’s also a reveal that Gavin and Nazim have been secretly working on a side-project of their own. And then the issue ends with an even more horrifying discovery.